With Six Feet Under playing par or slightly above par death metal on Unborn, I had high hopes for this album. Emphasis on “had.” Unfortunately, Barnes’ vocals seem forced and overly guttural. His style on Maximum Violence (1999) was perfect; you could actually understand what he was saying for the most part and it was brutal and vicious. I am not sure what his goal was for Crypt of the Devil, but when it comes to his vocals you never really know what you are going to get. In this case, too deep was not too good. The guitar work was one of the first things to stand out on a positive note. It is solid death metal and I’d say it’s the shining star of the album…cool guitar solos included. I can certainly appreciate when a band tries to veer in a slightly different musical direction. While I applaud the sudden time signatures and guitar solos on Crypt of the Devil, the overall package falls short. And, the reason for that is because all 37 minutes of the album sounds pretty much the same with very little variation between the songs. As I gave the album several spins before sitting down to write this and sadly I lost track of where the music was every time. While Last Remains and The Night Bleeds are two cool songs, I can’t really tell the rest apart. 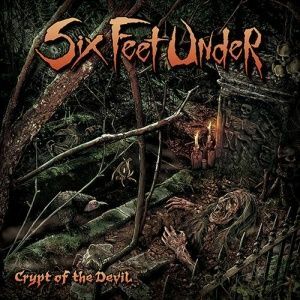 In the end, Crypt of the Devil is not the worst album Six Feet Under has every recorded, but certainly one that lacks uniqueness as a whole. Posted on May 11, 2015, in Album Previews and tagged Chris Barnes, Crypt of the Devil, Death Metal, groove death metal, Six Feet Under. Bookmark the permalink. 4 Comments. Six Feet Under (as well as Cannibal Corpse) is band I probably never really understand, i.e. why many people love them so much. It’s good, I like the groove and some of the solos (I own Maximum Violence & Warpath and know some singles), but I never found anything that really excited me. Also I’m always a bit irritated if an artist behaves like Barnes did with this record. As I read, he composed the whole record with the Cannabis Corpse-guitarist Phil Hall as well as recorded it with him. Why have a band, why have other band members (if not just for hire and touring) if you don’t respect them enough and don’t think they are capable of contributing anything to the band. To go behind their back and record an entire album without any involvement of them appeals to me as poor (humanly as well as artistically) and respectless. At least it isn’t the kind of mass production of a Max Cavalera. Anyway good, critical review – which can’t be taking for granted when it comes to a band with the kind of standing like Six Feet Under has. I was unaware of Barnes’ approach to recording this album. I didn’t do that much research on what went into the recording, but it sounds kind of lame to leave out key players and create music with out them. Perhaps this is what the album sounds different from most of their discography. From time to time I really dig 6FU’s music and grooves, but holy hell, Chris Barnes’ vocals are just atrocious and unlistenable; he sounds like an old man having a hernia. They could be a decent, junk-food style death metal band if he got off his high horse and brought in a tolerable vocalist. Ha, an old man having a hernia and constipated at the same time. This is one of those cases where he should have kept on growling like he did on their first few albums.